[June 20, 2017] (Reuters) - Undefeated middleweight world champion Gennady Golovkin has dismissed the high-profile crossover bout between American boxer Floyd Mayweather and Irish mixed martial arts champion Conor McGregor as a "circus show". Mayweather, a former multi-weight world champion who retired in 2015 with a 49-0 record, is coming back to face McGregor on Aug. 26, three weeks before Golovkin's middleweight showdown with Mexican Saul 'Canelo' Alvarez at the same Las Vegas venue. Kazakhstan's Golovkin believes the 12-round boxing match between Mayweather and McGregor, a double UFC champion who has never boxed professionally, is nothing more than a business arrangement for both men to rake in millions of dollars. "This is not for fighters, but business," Golvokin, who has won all 37 of his fights, told reporters of the non-title contest that is expected to draw a huge pay-per-view audience. "I think people understand what is a true fight, a boxing fight, like mine with Canelo or a big show, maybe sometimes for people a funny show, like a circus show. "Everybody knows. Conor is not a boxer, just a show. If you want to watch a show please watch them, if you want to watch a true fight, a true boxing fight and you respect boxing, watch my fight with Canelo." 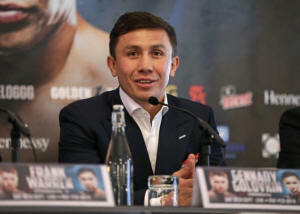 The 35-year-old Golovkin has made 18 consecutive world middleweight title defenses, while his 26-year-old opponent has won world titles in two division during a 51-fight career. Alvarez's sole defeat came against Mayweather in 2013. Last month, Hall of Famer Oscar De La Hoya also termed the Mayweather-McGregor contest a "farce" that should not be allowed to happen.